Personalized metal keychains and carabiners are a subtle yet effective way to start promoting your business to widespread audiences. They come in various shapes and sizes -- with options for laser engraving, screen printing or pad printing -- in order to find the best way for your logo to stay memorable on the keys of potential clients everywhere. Custom engraved keychains are a nifty trinket to include in goodie bags at events or simply as employee gifts. Start browsing our selection now! Promote success and let your logo shine with this UltraHyde strap silver plated custom logo keychain. With this Star-Shaped Custom Logo Key Ring, the next time your clients reach for their keys, your company logo will be the star of their keychain! A high-class promotional keychain with a wave design back and brushed silver face. Rectangle shape promotional keyring with 8 vibrant color options is laser engraved to last a lifetime. An UltraHyde promotional keychain with a brushed chrome-plated body for that vintage look. This rectangle spinner promotional key tag puts a new spin on the old fashion keyring. This circular spinner promotional key tag puts a new spin on the old fashion keyring. An distinguished zinc alloy custom bottle opener keychain that looks great and opens bottles with ease! Promotional Separator Key Tag / Holder is an easy way to manage your bulky keys. An elegant yet sturdy rounded promotional key tag your recipient will be proud to display. 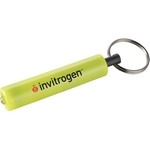 This promotional keychain is an elegant gift that any recipient will appreciate and give your brand maximum exposure. This shiny Custom Nickel Keychain with Spinning World Disk will let your company logo revolve around the world. The Two-Tone Bamboo Custom Key Tag features your logo laser engraved to offer a high-end look. Perfect for year-end holiday gifts. Promote your reputation as a problem-solver with this handsome promotional keychain. Laser Engraved to last a lifetime! Organize your keys with the Aluminum KeyStack Custom Key Organizer and never lose an important key again. It's the perfect size to fit into pockets or purses. Travel themed promotional keyholder with hand-polished nickel finish. Made with faux carbon fiber leatherette, this Metal Leatherette Custom Carabiner Key Chain will stand out! Laser engraved with your branding, employees and clients and alike will want to get their hands on this high-end keychain. This Laser Engraved Metal Leatherette Custom Key Chain has a high-end look and feel! It features a split ring on one end, and on the other end a spring loaded carabiner clip. A key way to raise brand awareness is through promotional product giveaways -- and ePromos' logo keychains and custom carabiners are ideal items. How many keys do you have on your daily keyring -- for either personal or business use? Probably a decent amount. Now you can help clients, employees and even yourself to stay organized all while promoting your brand. Custom engraved keychains made of metal have a higher perceived value than plastic options. We carry metal, nickel, chrome, brass and aluminum options to best fit your branding and company colors. No matter the industry or budget, our logo keychains make ideal promotional trinkets. Promote your real estate business by handing over the keys to a new home with your company logo engraved on a house-shaped metal keychain. Include your contact info or logo on the new keys for an excited new car buyer. Or advertise your bar or restaurant with engraved keychain bottle openers. You're guaranteed to find something for everyone. ePromos will help you through every step of the customization and ordering process. Start browsing our selection of custom metal keychains and carabiners and get in touch with our branding experts if you have any questions!